5. Passengers: Jennifer Lawrence plays a young woman who has joined an expedition to a space colony that will take over 100 years to reach from earth. She has exciting plans for the future there, and she, like all of the other colonists, is put in suspended animation for the journey to the colony. While still more than 90 years away from the destination, she is awakened from her pod. She is joined by another colonist who has been awakened, played by Chris Pratt. The two soon fall in love, making the best of a bleak situation . . . until Lawrence discovers that her awakening was no accident. Chris Pratt had been accidentally awakened and then, alone on the ship, had formed an obsession about her until he woke her up, essentially kidnapping her and destroying all of her dreams for her future, dooming her to spend her life alone with him on the ship rather than living a full life in a community on the new colony. Then he lied to her about it so that she would form a romantic relationship with him. Jennifer Lawrence realizes the man she fell in love with is a monster who stole her life and future from her by waking her up, trapping her into being forced to spend the rest of her life with him alone. 4. 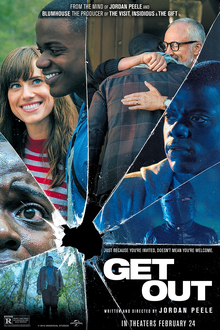 Get Out: Chris and Rose are a young couple in love, and Rose arranges to spend a weekend with her parents in the country and bring Chris along to meet them. Chris is a bit nervous—he is black and Rose is white, and she hasn’t told her parents that, promising him it won’t matter. In addition, her parents live a luxurious, wealthy life in the country, which is quite different from the life Chris is used to in New York City. She also neglects to tell him that a huge, elaborate party is being held that weekend with family friends. Gradually, Chris realizes something is a bit off . . . and then that something very disturbing is going on, and that his girlfriend is the monster at the center of it. 3. 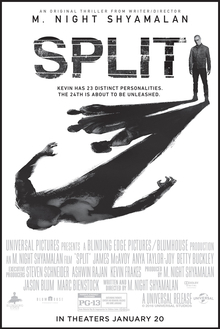 Split: Dr. Karen Fletcher is a psychologist who has a fascinating patient, Kevin Crumb, who appears to suffer from a multiple-personality disorder. She is excited by this discovery and feels she can make a prominent case out of him to prove to skeptics that such people actually exist. It ends up she’s more right than she knows, and her patient is a monster who abducts her. 2. 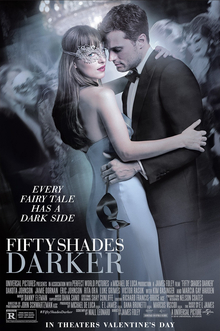 Fifty Shades Darker: Anastasia Steele is a college student who interviews handsome and enigmatic billionaire Christian Grey. He soon forms an obsession with her and explains he is a sexual sadist and wants to be in a relationship with her in which she is his submissive. Anastasia reluctantly agrees to a sexual relationship with him, but soon discovers he has begun engaging in behavior she did not agree to: he follows her around and has stalked her himself or sent minions to do so, tries to control her, buys the company she works for so he will be her boss and control her financially, tells her what she can and cannot do, and starts taking over her life. In short, he’s a monster. 1. 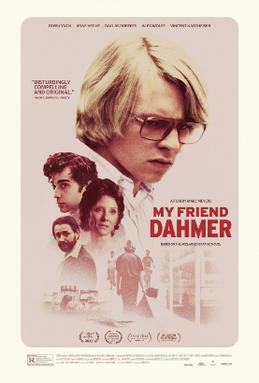 My Friend Dahmer: Based on a true story (in a graphic novel, mentioned in an earlier Top Five), by a guy who went to high school with Jeffrey Dahmer. The author, “Derf” Backderf, formed the “Jeffrey Dahmer Fan Club” while in school (of which Dahmer was also a member), because he and his friends thought Dahmer’s socially aberrant behavior was daring and cool. He was constantly ignoring proper rules of contact and rebelling. For example, he was known for pretending to have an epileptic fit, a performance to which he would truly commit. Or he’d pretend to have cerebral palsy. Or he’d disrupt class by screaming suddenly, then looking innocent, leaving teachers with no clue as to who caused the disruption. He even became legendary in school because, on a school trip to Washington, DC, he talked his way into being invited to meet Vice President Walter Mondale in his office. The Fan Club’s appreciation of Dahmer reached its pinnacle when they paid him $50 to do his epileptic and palsy routine at the local mall . . . at which time they abruptly realized that he was a monster and became very uncomfortable and distanced themselves from him. It was within days after high school graduation than he committed his first murder.